A major component of the web strategy is to implement a mapping application to show Green Infrastructure projects. This application can be accessed through the ‘Other Themes’ menu on NYCityMap or by clicking here. Ever wondered who represents you at the local, state and federal level? Your representatives are determined by where you live. We’ll steer clear of the political redistricting discussion and focus on the topic. To find out, you can search NYCityMap. From an address search, click “Show Additional Information…” as shown below. 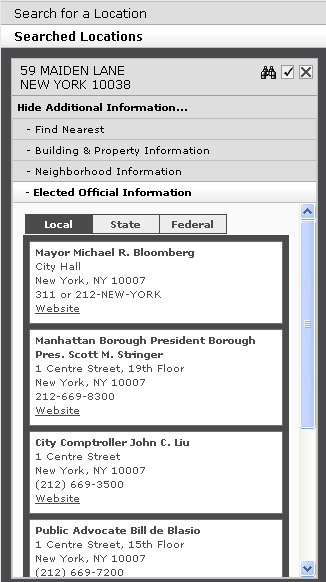 At the bottom of the subsequent panel, click “Elected Official Information” as shown below. There are tabs across the panel for viewing Local, State and Federal elected officials. Additionally, there is a vertical scroll bar along the right side to navigate the content. If you find any errors, click “Feedback Form” at the top of the page and let us know.